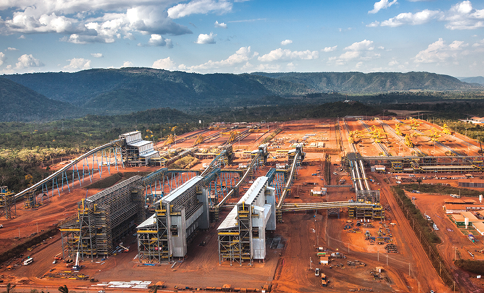 Vale announced on December 9 it has received the operating license for its S11D surface iron ore mine and plant in Pará state, Brazil, and that commercial shipments will begin in January. The project is the largest in the company’s history. Total investments are estimated at $14.3 billion: $6.4 billion for a mine and plant with production capacity of 90 million metric tons per year (mt/y) of iron ore and $7.9 billion for a 101-kilometer (km) railway line that double-tracks the existing Carajás Railway to port and for expansion of the Ponta da Madeira maritime terminal in São Luís. Vale’s S11D has three production lines (above) and will operate a truckless mine. The S11D mine and beneficiation plant are located in Canaã dos Carajás, Pará. The plant has three production lines, each capable of processing 30 million mt/y of iron ore at an average grade of 66.48% iron. The mine is based on a truckless system of excavators and mobile crushers that feed ore to conveyor belts for transport to the beneficiation plant. The maximum distance between ore collection points and the plant will be 15 km. The S11D project is expected to reach full production in 2018. Its lifespan is currently estimated at 48 years. The S11D project is named after its location in block D of the S11 orebody, located south of Vale’s Carajás mine, which has been operating since 1985. S11D is just one block of an orebody that has been divided into four parts: A, B, C and D. The total mineral potential of the S11 orebody is 10 billion mt of iron ore, with block D accounting for 4.24 billion mt. The new rail line to port was placed in operation in October with the circulation of an empty, 330-wagon train. The new berth for Pier IV in Ponta da Madeira began commissioning in November, with the loading of three of Vale’s very large ore carriers (VLOCs). The current S11D operating license is valid for 10 years and was issued by Brazil’s Ibama environmental agency. The S11D plant, iron ore stockyards, distribution yards, train maneuver and loading area, and waste rock and overburden storage areas are all sited in an area of pastureland outside Carajás National Forest. This location has reduced the amount of vegetation cleared in the forest by more than 40% compared with the original S11D master plan, which called for 2,600 ha to be cleared. The Carajás National Forest covers 412,000 ha. Even after S11D has been fully implemented, just 4% of the forest area will have been affected by mining activities since Vale came to the region 30 years ago. Nyrstar NV announced it has entered into share purchase agreements to sell its Contonga mine in Peru and various mineral claims located in Quebec, Canada, to subsidiaries of Glencore plc for a total cash consideration of $26 million. The total cash consideration is made up of $21 million for the Contonga mine and $5 million for the mineral claims. Closing of the transactions are subject to customary closing conditions and are expected to occur in the first half of 2017. The transactions are part of the sale process for all or the majority of Nyrstar’s mining assets, which was formally launched in January and includes the completed sale of the El Toqui mine in Chile and the announced sale of the El Mochito mine in Honduras. Nyrstar NV announced it also entered into a share purchase agreement to sell its Coricancha mine in Peru to Great Panther Silver Ltd., a primary silver mining and exploration company, for a total cash consideration of $100,000 plus earn-out consideration of up to $10 million. Under the earn-out, Nyrstar will be paid 15% of the free cash-flow generated by the Coricancha mine during the five-year period after which the Coricancha mine is cumulative free cash-flow positive from closing of the transaction. Closing of the transaction is expected to occur in the first quarter of 2017. The transactions are part of the sale process for all or the majority of Nyrstar’s mining assets, which was formally launched in January 2016 and includes the completed sale of the El Toqui mine in Chile and announced sales of the El Mochito mine in Honduras and the Contonga mine in Peru. Nyrstar NV also successfully completed the sale of its El Mochito mine in Honduras to Morumbi Resources Inc, a Canadian-based mining company, for a total cash consideration of $500,000. As previously announced, the share purchase agreement for the sale was entered into on September 22. As part of the completed sale, Nyrstar and Morumbi have also entered into an off-take agreement where Morumbi will sell to 100% of the zinc and lead concentrate production from El Mochito to Nyrstar for the next 10 years at benchmark terms. On December 12, Antofagasta Minerals received approval from environmental regulators of a proposed expansion of its Centinela mine in northern Chile. The project will cost around $4.35 billion and will be done in two stages to increase copper production and extend the life of the mine until 2056.